Media FHE HEi-think: Staffordshire is reaping rewards of thinking "what have we done for our students today?" 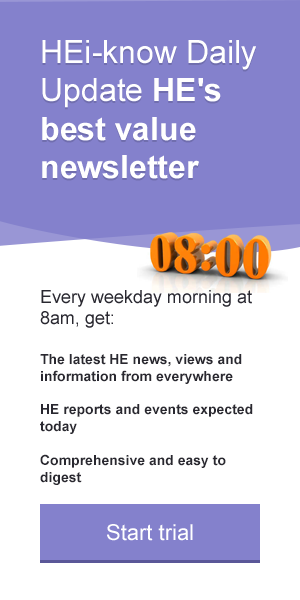 You are here: Home > HEi Know > HEi News > HEi-think: Staffordshire is reaping rewards of thinking "what have we done for our students today?" Staffordshire University’s efforts to discover and respond to the needs of its students has helped it towards impressive results in the latest Guardian University rankings, Complete University Guide rankings and Times Higher Education Student Experience Survey. But now is not a time for any university to be resting on its laurels, says its Vice-Chancellor, Professor Liz Barnes. Recognition of our efforts to improve the student experience is a positive thing and helpful to prospective students who are looking to make the smart choice when it comes to university. Our ‘most improved’ status in the recent Times Higher Education Student Experience Survey is confirmation we are moving in the right direction and more importantly that we are adapting to the needs of our diverse student community. High student satisfaction scores – together with an improvement in graduate prospects – have also contributed to our 32 place rise in the Complete University Guide. But still there is no room for complacency. At Staffordshire, we have worked closely with our Students’ Union on a customer segmentation project to group students into seven groups who all want very different things from their student experience. We know that 66 per cent of our students - double the national average – remain living at home and 34 per cent are classed as mature and are having to fit their study around other commitments such as family and jobs. For this reason, we’re working hard to create a campus environment where students are encouraged to stay longer, where learning continues beyond the classroom and our students have access to facilities 24/7. In North Staffordshire we also face a demographic challenge. Currently only 28 per cent of young people in Stoke-on-Trent - home to our main city campus - are likely to progress to university, compared to 42 per cent in London. Our students include people who’ve had a difficult start in life and so getting our induction processes right for them is crucial to their progression through university and the reason why we’ve extended this from the traditional two weeks. Success manifests itself in the form of well-rounded graduates, confident of their own abilities, who leave us with stories of how their university experience has transformed their lives and career prospects. However, the government spotlight on the costs of higher education has led many outside our sector to question the value of universities. Consequently, we are having to work ever harder to convince students, parents and employers that a degree is a worthwhile investment. And we must make sure our courses and teaching, facilities and experience live up to the promises we make. I speak proudly when I say our graduates have a strong sense of their social responsibility, wanting to give back to their communities and helping to support and grow our economies. Not all are focused on highly paid corporate careers - many are nurses and teachers who won’t necessarily have the highest incomes but whose value should never be measured in terms of their pay. My hope from the review of fees is that disparities in the system are addressed and bursaries for students from poorer backgrounds are reinstated to ensure university – and the opportunities it brings - is accessible for all. Meanwhile universities need to innovate to stay ahead, to respond even more closely to student needs and expectations. We understand student expectations of customer service are rising. We also know students can and do use social media to express their views on their student experience and so we need to keep pace with changes in technology and harness those opportunities. Student communications is key to this and we are formulating our plans around insight gained from our student surveys and by including students in our social media planning to ensure we are effectively engaging our audiences on the most relevant channels. Since joining Staffordshire University, I have encouraged colleagues to think at the end of every meeting about what we have done for our students today. And while there will always be work to do, I passionately believe this people-led approach lies at the heart of a first class student experience. Since this article was published, the Guardian's university rankings have place Staffordshire in 44th place -- up from 67th in 2017.